“One-One-One” performed by Ioannis Mandafounis and Emilia Giudicelli as part of the closing triple-bill of JOMBA! 2018. Photography by Val Adamson. 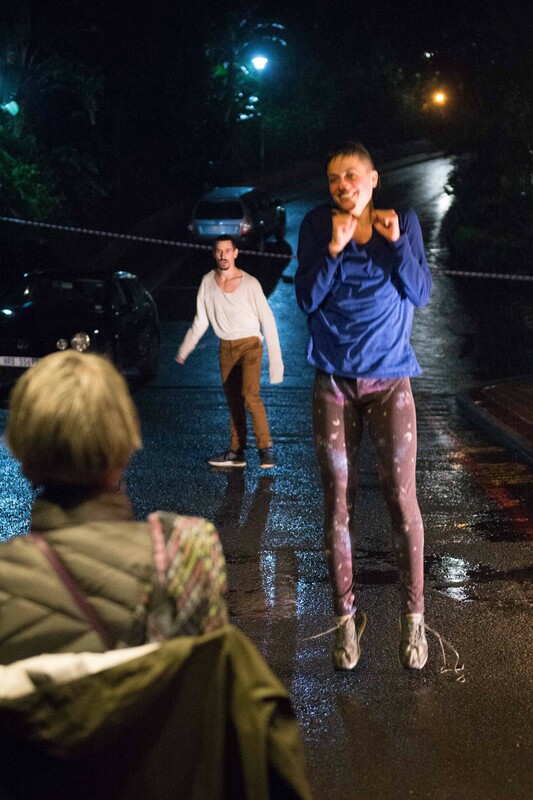 A day of rain did not keep Ioannis Mandafounis and Emilia Giudicelli from dancing in the driveway outside the Elizabeth Sneddon Theatre for the finale to the 20th season of JOMBA! For die hard festival goers, we’d seen this performance already at the Durban Art Gallery (DAG) the night before, though “One-One-One” is never the same twice. Mandafounis and Giudicelli (Geneva, Switzerland) invite two audience members to sit in a chair — one for each of them — and ask them to simply make eye contact, standing up and leaving if or when they feel uncomfortable or bored. This is the dance version of a staring contest: challenging the viewer to look, really look, perhaps allowing them to see dance differently than before. Ducking in and out of the sheltered portico where their subjects sat, they advanced and retreated, coming back wetter and more alluringly compelling each time. The duet kicked off a rather brief and unadorned evening of dance, with another duet and a solo making up this triple bill of international choreographers, and the final evening of JOMBA! Aida Colmenero Diaz in her solo “Aka Nativa”. Photography by Val Adamson. Aïda Colmenero Dïaz performs alone with a microphone and minimalistic, colorless lighting (by YAKART) that follows her around the stage. Titled “Aka Nativa,” Dïaz refers to this work as a manifesto, an embodied collection of lived experiences and research in Spain and Senegal, but the politics of “Aka Nativa” are captured in her body more so than her words. The Madrid-born choreographer, undeniably trained in classical Flamenco, deconstructs the form in a way I hadn’t yet encountered: unpacking its Andalusian roots blending North African, Syrian and Indian traditions. She alludes to this in the careful placement of her thumb and forefinger pressed against her breastbone, creating mudras as she arches her back in a single down pool of light. 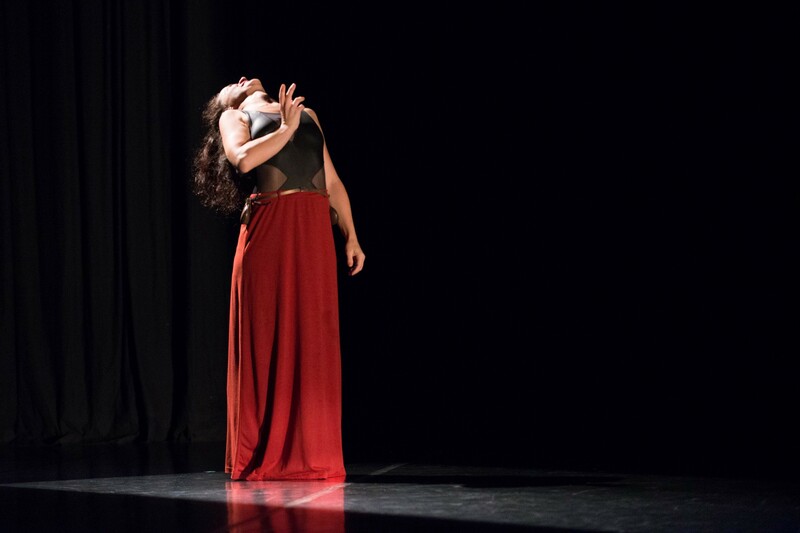 A blackout finds her on the other side of the stage; castanets hanging from a thin leather belt at her waist which inadvertently clap as she moves places in the dark. Here, Dïaz drops her weight into her pelvis and pivots a knee in and out, a sharp hand to her pelvis and an undulating torso in another pool of light, opting for bare feet and a simple long red skirt rather than the traditional Spanish garb. When she brings a hand to her waist, she tickles one castanet with her finger tips, a slight smirk on her face, an overt transgression to how this thing is typically used. “Are you with me?” she says, on more than one occasion. The previous night at DAG, Dïaz showed a series of short dance films tucked into Gallery #2 — an appropriate corner of the hall, on which women-centered poetry by UKZN lecturer Pumelela “Push” Nqelenga is stenciled. Dubbed “She-Poems,” the films are close-up, intimate portraits of African women she’s met along her travels — perhaps the memories of them are present in “Aka Nativa,” too. “What is my revolution?” she says, the weight of a complicated history on her back, and for much of the piece, the pitter-patter of the rain on the Sneddon’s tin roof as the only score but for her voice. Haja Saranouffi’s “Danse des Bouteilles”. Photography by Val Adamson. 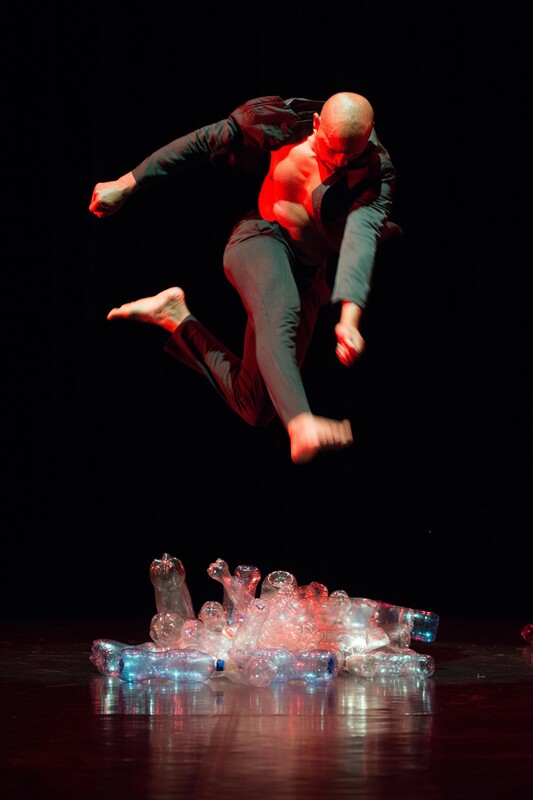 Arriving onstage, Saranouffi is joined by dancer Harivola Rakotondrasoa, and the bottle buffer is, for a while, discarded onstage. One usually is drawn to ideas of sustainability, and the irony of water, though vital, captured in a wasteful container which claims so much responsibility for environmental decay. The two men perhaps symbolize this ironic yin and yang, coming in and out of a central pool of light for what might be described as a hip-hop-inspired dance battle. As the string of bottles joins the two men at the end, there’s a beautiful kiss between them; while the meaning of it alluded me, it seemed a most-fitting end to these 13 days of JOMBA!